Before the world recognized Catena’s Argentina as “malbec country”, the winery was known for its old-world style Cabernet Sauvignon born in the clay-soils of Agrelo. The family cherishes its historic Cabernet Sauvignon vineyards in Agrelo and Tupungato, particularly for their ageability and classic flavors. 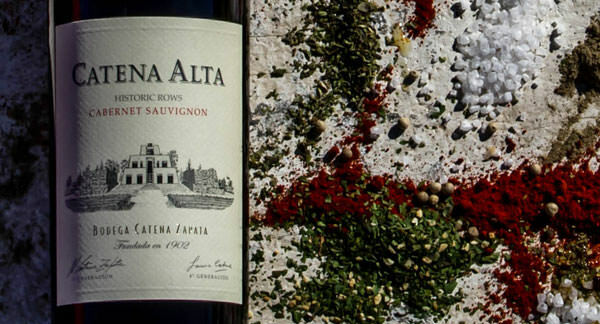 Catena Alta Cabernet Sauvignon is sourced from Lot 3 of the La Pirámide vineyard, Lot 2 of the Domingo vineyard and Lot 2 of the Nicasia Vineyard. Elevage: 18 months in French oak barrels. Lot 3, La Piramide Vineyard, Agrelo, Luján de Cuyo (950m/3116ft). Aluvial origin. Clay topsoil with rounded rocks on the bottom. Plant selection: Selección Mendoza. Lot 2, Domingo Vineyard, Villa Bastías, Tupungato, Valle de Uco (1120m/3674ft). Aluvial origin. Silt loamy soil with limestone on the bottom. Lot 2, Nicasia Vineyard, Altamira, Valle de Uco (1095m/3592ft). Aluvial origin. Loamy soil, with rounded rocks on the bottom.